It is fairly easy to find decent tonkatsu dishes around New York City, most restaurants serving Japanese food have them, and do them well. Honestly, there is not much to breading and frying a pork cutlet I suppose. But to find the best in town, go to one of two Katsu-Hama locations in Midtown. Upon entering the 47th Street location, walk past the small udon bar and into the back restaurant. The place can get packed with business lunchers, but coming after 2pm or for dinner finds the place very mellow and easy. In preparation of your katsu meal, they give you miso soup, a small portion of pickles, and a grinding bowl with sesame seeds (above) to make your own sauce with the table's portion of tonkatsu sauce (below). Prices are on the rise, but the quality still remains intact. The simplest of meals, but most authentic way to enjoy the dish, is the hire katsu ($19, below). A beautiful wedge of breaded pork that is served with a pile of cabbage, which you should not be shy to ask for more of if you run out. Excuse the poor photo, this is a very nice arrangement in person. To be expected from a tonkatsu-specializing restaurant, you can get your pork in many ways, the most popular of which seemed to be with curry as at least half the other diners were eating it this way. 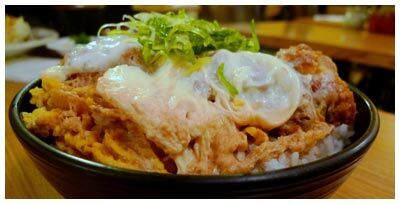 I am a big fan of the katsudon ($15.99, below) though, served with egg over rice. If you are going to have this dish, you might as well do it in a place that serves the best tonkatsu. The rice here is definitely something to enjoy, fluffy and moist. The place as a whole is a little hodgepodge, stacks of boxes and bottles of wine laying around, with waiters that can be a bit aggressive even when the restaurant is not at peak, but I think this is just leftover from the really busy hours. It is really the meal that should be focused on anyways, and this passes tests with flying colors.